Do You Need to Describe Wine Like the Pros? Of Course Not. How do you describe wine? It’s amazing how many terms people use to describe it. Taste, mouth feel, bouquet, color, palate (really a misnomer because that’s really part of your mouth) clarity, body, aroma, legs (yes legs…we’ll get into that in a bit), never mind a mind boggling array of individual smells that even a bloodhound would have a hard time distinguishing. Most are useful in describing wine to knowledgeable wine folks but some are as pointless as owning a pair sunglasses in England. Humans have five senses. Are all of them actually useful to describe wine? Let’s take a look at each sense and see if it makes sense (no pun intended) to use it to describe wine. Hmm….touch to describe wine? Well, unless wine is a finger food in your house, I’m not seeing it. Admittedly, even soup is a finger food in our house, but dipping your finger into a wine glass to test its quality is a complete waste of time and it will get you really odd looks if you do it in a restaurant. Do you hear that? Nope, neither did I. Despite many writer’s attempts to “wax poetic” about wine, it really isn’t a great conversationalist. You’re likely to accumulate dust bunnies in your navel before you hear anything noteworthy from a glass of wine. Now before the smart asses in the audience get overly technical and point out that you can actually hear the bubbles in sparkling wine – I get it. If you hear the bubbles, it is still carbonated. If not, it’s flat. But seriously, did you need to stick your ear next to the glass to figure that out? The little round things rising to the surface weren’t enough of a tip off? Now we’re getting somewhere. Sight is usually the first thing that you’ll experience in a glass of wine. The two things to look for are the color of the wine and the clarity of it. Color is useful but only if you know what a specific type of wine is supposed to look like. Let’s take an example. If you don’t even know what a Pinot Noir is supposed to look like, what’s the point in observing the color? Can you tell a good Pinot from a bad one based solely on the color? Few people can. There’s one other visual indicator that was all the rage in the 80’s (you remember the 80s right?…big hair on the girls and mullets on the guys, quiche everywhere and white zinfandel “taking off”.) I wasn’t even into drugs and I still get flashbacks. In wine however, everyone talked about legs. What are legs in wine? Turn a glass of red wine on an angle and gently rotate it several times and then stand it back upright. In the 80’s, if you saw the wine coalescing into several small streams as it flowed back to the bottom of the glass, you’d just observed “legs” in wine. The problem with legs is that it only provides a clue as to the viscosity of the wine, not the quality. Hell, motor oil will leave legs in a wine glass but would you really want to drink it? If you are going to describe the visual aspects of wine, then color and opacity are the key attributes. Red wines are primarily described as Burgundy (the color came from the wine from Burgundy, France by the way, not the other way around), Ruby, Red or Purple. Several wines, Nebbiolo being the most well known, are actually Brick Red in color. 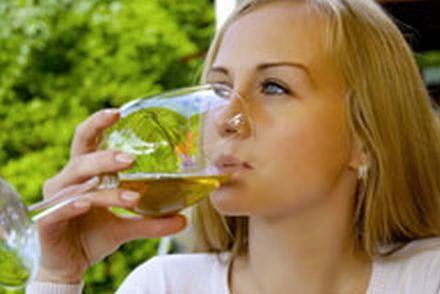 White wine is usually described in shades of Yellow, Gold and Amber. Opacity describes the amount of light that can penetrate a wine. Usually, the heavier the wine, the less light will pass through it. Now we’re getting somewhere. I love the smell and taste of good wine. It’s completely enticing. It can be subtle and alluring or brash and bold but even the aromas of huge wines are subtle when compared to most smells though. Perfume, flowers and particularly pungent foods can overwhelm the smell of a wine (garlic anyone?). If you’re going to smell your wine and we always suggest that you do, don’t be coy. You’re not smelling bad Whiskey or Tequila that can burn the retinas out of your eyes if you get too close. Stick your nose right in the glass; the farther the better without actually snorting the wine of course. So what do you smell? Well, if you’re not primarily smelling fruit, spices or something slightly herbaceous you probably have a bad glass of wine. Those appealing, natural smells that are part and parcel of every glass of wine are what are used to describe the smell. Do you smell a hint of strawberry? Then use the word “strawberry” to describe the smell. Wines are described by drawing an analogy to another smell that is well known to an audience. It’s as simple as that. Smelling any hint of a chemical, mustiness or mold is a virtual certainty that the wine in question is flawed but it’s OK to use those terms. I’ve heard the smell of flawed wines described as “dirty socks”, “wet dog”, “barnyard”, “moldy” and a host of equally unappealing aromas that you would not want anywhere near your face. Unappealing as those terms may be, they are still valid ways of describing wines. One disclaimer…everyone’s body chemistry is different so an accurate description of a wine for one person may be different for some one else. One person can pick up different things in wine over different days because even people’s individual body chemistry changes. So what do you use to describe the taste of wine? Isn’t taste the real reason we drink wine anyway, except maybe that “buzz” that most people like? Not surprisingly, describing taste is usually done using the same terms as describing the smell of a wine and those terms usually include fruit, spices, herbs and smoke for the good and all the other crap for the undesirables. The experts occasionally make describing wine seem intimidating but it really isn’t that tough because the terms that are used are almost universally known. When all is said and done, there’s no magic language for describing wine. Describe what you smell and taste by comparing it to other things that people recognize and forget the snooty terms that some wine experts use. terroir is not an "invented" word... fool.. it is a French word [land, earth, soil] Honestly what an article. Disclosure…sometimes I get caught up in posting blogs and forget to approve comments. This one came in months ago and got caught in the chaos of running a home business. Every once in a while we get a snarky comment to a post and this one just tickled my funny bone although not for the reasons that author intended I’m sure. For those of you who didn’t see the comment above regarding our post about terms that are used to describe wine, here was the comment with our response below. “terroir is not an “invented” word… fool.. it is a French word [land, earth, soil] Honestly what an article.” ...and our response.... Wow…you must be a linguist of world class standing. Let’s take a look at your opinion from a few perspectives because clearly you are a very literal person. We’ll start from the least literal and work our way up the “literality scale”. 1)	You obviously missed the point of the blog post which was: - to help demystify wine. That’s a recurring theme in our site. Too many people are afraid to ask questions for fear of sounding uninformed. “Terroir”, like many terms used to describe the characteristics of a wine, is intimidating to the uninitiated so it was a good term to illustrate the point, which gets us to the other point of this post. -to have a little fun. This was written with tongue planted firmly in cheek as many of ours are and if you don’t get my sense of humor, fair enough. It’s slightly bent at the best of times. 2) Now, let’s take your comment a little more literally. I agree that “terroir”, literally does translate to “earth” or “soil”. However, in the wine industry, rather than just denoting the dirt in which a wine is grown, it has come to connote far more than dirt, and unless you are a complete hypocrite, even a purist like you has to admit that tasting terroir in a wine is far more than tasting the characteristics of the dirt. Where the grapes come from in the vineyard, the exposure to the sun, wind, evening or morning fog and a host of other traits all contribute to a wine’s sense of terroir. Trying to claim that the term terroir only references dirt, when applied to the characteristics of wine, is just silly. 3) Now let’s get completely literal, because clearly you are a stickler for 100% accuracy. You stated that, “terroir is not an "invented" word... fool… it is a French word [land, earth, soil]...”. As I said above, I agree with you on the literal translation. However, if you really want to get technical, which I assume you do because you provided the technical translation of terroir, then I’ll disagree with your point because every word in every language is invented. I would wager that thousands of years ago, a band of French Hunter-Gatherers weren’t walking around, only to stumble upon a clay tablet or scroll with the word “terroir” scribbled on it. It’s likely that someone “invented” the word terroir to “denote” dirt in proto-French or a similar word in Latin but over the last several thousand years, it has evolved to “connote” all of the characteristics imparted to the wine grapes by the vineyard, not just the dirt. I guess the real point of this response is to reinforce our message that wine doesn’t have to be intimidating and people like you who insist on “pure” terms are the ones who make it intimidating for the people who just want to learn about wine without fear of being made to feel inferior.